The first gas stations along Route 66 were simple curbside pumps outside general stores. By the late 1920s, the Mother Road supported stand-alone gas stations--usually two pumps beneath a canopy with a simple office attached. Over time, gas station buildings became more substantial. Sprague’s Super Service in Normal, Illinois, may well represent the apex of this trend. By 1931, when William Sprague built his station, most of the nation’s gas stations were affiliated with major oil companies such as Pure Oil, Phillip’s Petroleum, or Texaco. Architects for these companies provided functional, standardized station designs. Drivers could glance at a white building with three green stripes, for example, and know at once that because of the recognizable icon it was a Texaco station. Like other small entrepreneurs of the time, Sprague took a different approach. A building contractor, he constructed his large, unique, brick, Tudor Revival gas station using high-quality materials and craftsmanship. 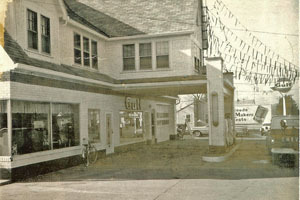 The result, Sprague’s Super Service, appeared to be part manor house and part gas station, and sold City Service gas. Steep gables distinguished the broad, red roofline. Substantial brick peers supported the canopy. Stucco with decorative swirls and contrasting half timbering distinguished the second story. Distinctiveness was important—just like brand-name operators, independent operators had to create brand loyalty, even if their brand was their individual operation. They also worked to promote their identity as good neighbors and local producers, setting themselves in opposition to corporations, which they defined as large and impersonal. As road construction and automobile use grew, so did a backlash against its commercialism and the “ugliness” of commercial architecture. The Tudor Revival style Sprague chose for his station, with its historical and domestic overtones, helped to both establish a local, homey identity and promote a conservative, rural aesthetic. In the depressed 1930s, when gas far outstripped consumers, independent operators could use this civic persona to help sell their gasoline. Visitors can easily imagine the 1930s, when Chevrolets, Buicks, and Plymouths pulled up under the canopy, and the station attendant pumped their tanks full of gasoline at 10 cents a gallon. After buying gas, travelers could step inside and eat at Sprague’s restaurant or pull into the bay and have their cars repaired. These enterprises occupied the ground floor of the building. Upstairs, a spacious apartment, complete with a sun room over the gas pump canopy, housed Sprague and his family. A second upstairs apartment housed the station attendant. Throughout the 1930s, most people passing through Bloomington-Normal from north or south traveled Pine Street. Traffic was heavy enough to support both Sprague’s and, just across the street, Snedaker’s Station and Bill’s Cabins, another 1930s service station jointly administered with a lodging operation. Pine Street’s heyday was short lived, though. In 1940, the new four-lane Route 66 opened around the east side of Bloomington, siphoning through-traffic off of East Pine Street. Some traffic still took the Business Route 66 into Normal, so the station remained open, but the property changed hands many times as each new owner sought business opportunities with more appeal for local clientele. The station was vacant for part of World War II when gasoline and repair parts were scarce. Beginning in 1946, immediately after the war, the owners still sold gas and food, but they added other enterprises as well. Over the years, Joe’s Welding and Boiler Company, Corn Belt Manufacturing, Yellow Cab, and Avis Rent-a-Car occupied space at Sprague’s. So did a bridal store, cake gallery, and catering operation. Since the 1960s, these other enterprises have supplanted the gas station function of the building; the pumps were removed in 1979. 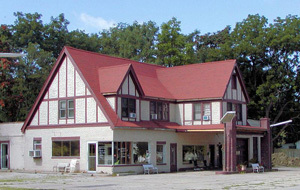 The present owner purchased the building in 2006 and it was listed in the National Register of Historic Places in 2008. Plans are underway to rehabilitate the lower level of the station for use as a visitor center, restaurant, tea room, and meeting and performance space. Grants from the Town of Normal, the Illinois Bureau of Tourism, and the National Park Service’s Route 66 Corridor Preservation Program have helped to support the work. The owners would also like to use the Federal Historic Rehabilitation Tax Credit to help defray the costs of rehabilitating registered historic buildings in the project. The only Tudor Revival canopy gas station in the State of Illinois, Sprague’s is a testament to sound construction and local ingenuity. Sprague’s Super Service is located at 305 East Pine St. in Normal, IL and is currently used as a private residence. The National Register nomination form for the building can be found here. More information about the Route 66 Corridor Preservation Program can be found here.